Minecart rides primarily serve two different functions—transportation or entertainment. 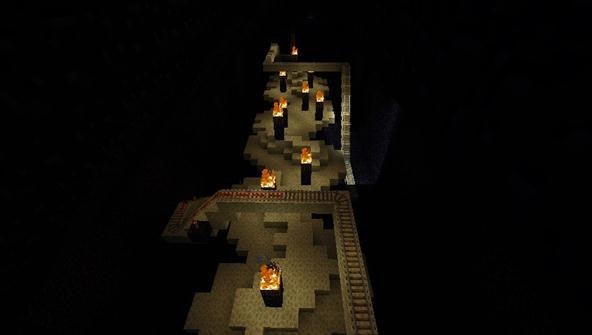 We rarely see minecart-based transportation systems in Minecraft these days because most servers support warps or allow users to set multiple homes that they can simply teleport to. That leaves the primary purpose of entertainment. Honestly, I've lost count of how many boring minecart rides I've been on, and they all seem to do the same sets of things. So, let's examine those things and discover the recipe for making a great minecart ride! 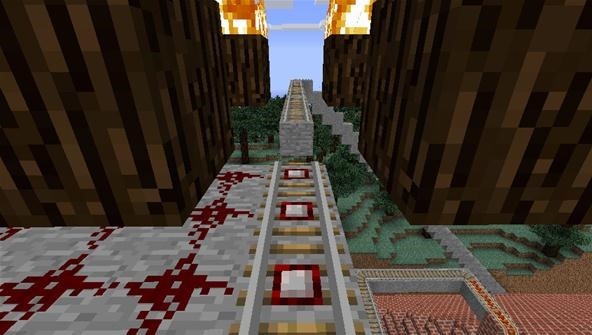 Inevitably, people will make minecart tracks that emulate their only other source of inspiration: roller coasters. 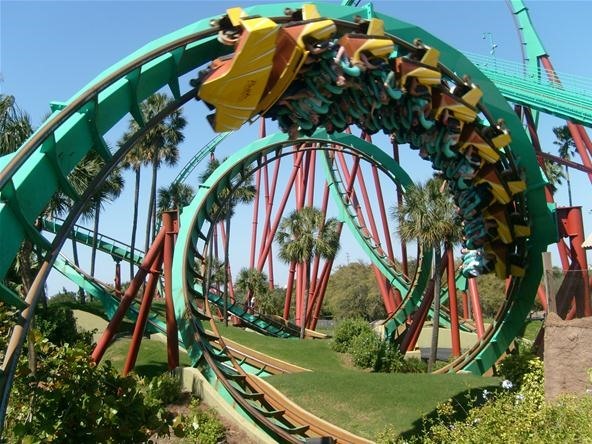 But roller coasters are the way that they are for a very specific reason—to elicit an emotion. That emotion is created by the specific forces that act upon a rider's body, as well as their own lack of control. 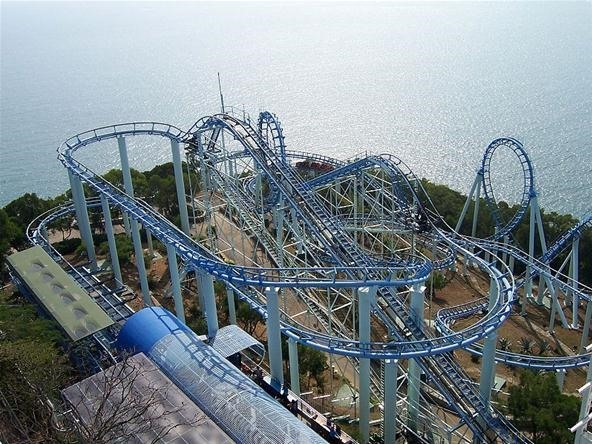 The fear that this generates releases a lovely cocktail of adrenaline which, in turn, can make the rider giddy. It's this feeling that thrill-seekers constantly chase. There's a lot of science that goes into roller coasters, and they're designed in such a way as to maximize these very specific criteria. In the land of Minecraft, it's pretty clear that you can't exert g-forces on a person's body when they ride a minecart. There's no fear of death, and there's really no threat whatsoever. So, when you think about it, it's obvious that simply following the designs created for real-life rollercoasters will get you nowhere. 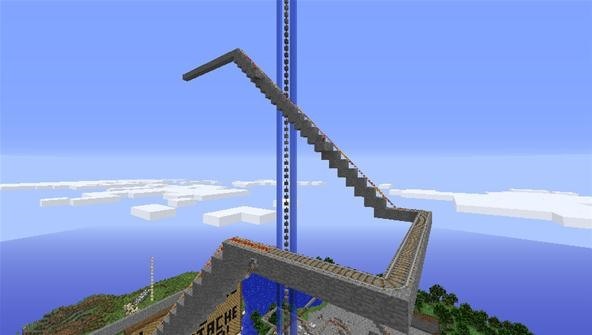 Many people who start out trying to make a minecart roller coaster in Minecraft will use the same sort of techniques they've seen in real roller coasters: quick turns, ups and downs, etc. 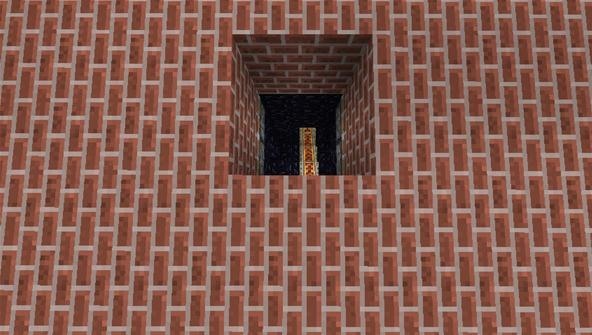 Everything that would be quite thrilling in real life is rendered merely annoying in Minecraft. Who likes it when their screen shakes around and they can't tell what they're looking at? Hardly anyone. I certainly don't. So, if you can't thrill a person in a minecart ride, what's the point? What CAN you do? Since thrilling a rider is off the table, so to speak, the next best thing is to surprise them. But surprising a rider on a minecart ride is more difficult than it may first appear. When you can't physically surprise someone by pushing them, shocking them, or touching them in some way, you're limited to the realm of what I like to call managing their expectations, or misdirection. For example, a ghost popping up in a haunted house won't be as surprising as a ghost popping up in a bathroom. That's because people expect to see ghosts in haunted houses... no one expects to see a ghost in their bathroom. Or at least I should hope not. There are a lot of ways to manage someone's expectations, and by doing so, continually surprise them. For example, in my minecart ride in Moustache World on our server, there's a place where the cart drops off the tracks and lands on another set of tracks below it... that's nothing special, it's just a simple drop. But in this case, I have tracks ahead that disappear off behind a corner, with a break in them. So for all intents and purposes, it looks as though the track is broken. This creates the expectation in the rider that something is wrong, and their ride will end. But instead, they drop down into a completely unexpected area and the ride continues. The only reason this works is because the rider can see it coming. Rather than just surprising them with a drop, I surprise them because they've had a chance to see the broken rail, and form the expectation that it isn't supposed to be that way. This is just one way in which you can take advantage of a players expectations—there are many more. Have things be not as they seem. You can use pistons to move tracks around or drop a cart through a lake—even through fire. Introduce new and unexpected landscapes or art. Push the cart off the side of the track with a piston. The biggest mistake that many people make is to conflate 'surprise' with 'quick'. That is, most people underestimate exactly how fast a minecart goes. It doesn't seem that fast when you're building a track, so any surprises or views are often just too short. They come and go so fast that a rider not only can't appreciate them, but sometimes can't even see them. A good surprise may sneak up on someone really quickly, but then it lingers around long enough to be appreciated, even if it's just two or three seconds. So, let's take a look at a few of the ways that you can surprise a minecart rider. Drops are easily to conceptualize... it's just a break in the tracks so that the cart falls off. However, if the cart lands on a track below it, it will automatically stick to that track. There are a few things to keep in mind in order to take full advantage of drops. When a cart runs off the edge of a track, it will immediately start falling, but for two or three blocks, it will also continue moving forward. Once the cart has moved forward its two or three blocks, it will fall straight down. You can take advantage of this vertical motion to drop the cart through things like trap doors, lakes, lava, or whatever you want. It's important to bear in mind that while water will destroy tracks, a free-falling minecart will pass through it unharmed, and will then be able to continue its journey. When a falling cart lands on a flat track (even a powered flat track), it will just sit there. In order to maintain forward momentum, the cart needs to land on a slant, so that it can roll downward. Since the cart is falling straight down, it no longer has any momentum in any other direction. This means that the track it lands on can be slanted in any direction, and the cart will immediately go that way, even backwards! Another surprising thing you can do is use pistons to push the cart onto a different set of tracks. The tracks may continue in front of the rider, but then all of a sudden they hit a detector rail and get pushed sideways. Pistons imbue the cart with a significant degree of lateral momentum, so it's pretty easy to use that trick to move carts around. The only tricky part is timing the piston so that it doesn't go off too early or too late. Give yourself some extra room, and add repeaters so that you can add or subtract delay at your convenience! Pistons can move more than carts. Pistons can also move tracks! Sticky pistons can actually push and pull tracks that are on the ground, and that can be used to a variety of different effects. You can literally pull the tracks out from under someone and throw them into a drop, or you can make a drop disappear and let your cart pass safely over it. Something to keep in mind is that if the tracks are ever over nothing, they'll break. So make sure that you have extra pistons to move the ground underneath them, too. One of the best ways to surprise a rider is by showing them something they don't expect to see. Is your area in a desert? Then maybe try dropping them into a lush, tropical cavern full of trees and low-hanging vines. My minecart ride passes through a recreation of The Nether and The End, but use your imagination! The more unexpected, the better, but try to make it related to your theme. For example, dropping a rider into a forest from a desert will probably have more positive impact than dropping the same rider into a giant recreation of, say, a bathroom. No, I'm not entirely sure why I keep mentioning bathrooms in this article, but if I were on a ride and I suddenly found myself in an enormous bathroom, it wouldn't be so much surprising as it would be confusing. While you don't have any overt control over how fast your minecart goes, you can use a combination of powered and unpowered rails to influence its speed. Keep that in mind, and try slowing a cart down for dramatic effect before the cart tips down a long hill. Or falls off a cliff. Or just slow the cart down so that the rider can appreciate all the work you put into the scenery. The main thing to remember is that if the cart slows down, it needs to be for a reason. Riders can get bored very quickly, so don't forget to speed it back up! The best minecart rides will combine many of the things that I've mentioned above in new and interesting ways, and do it without repeating the same tricks over and over again, which can get boring. When your rider starts to expect unexpected things, your ride is probably too long. Find the sweet spot in terms of length, and above all, keep it fresh and unexpected! Think of your ride as a showcase for how clever you can be, rather than how many twists or turns you can make, or how many times you can show the same room from a different angle. Remember, for the duration of the ride, your passenger is a captive audience; they have to look at what you show them. Take advantage of that! Your minecart ride is really almost like a short video... it can tell a story, evoke an emotion through atmosphere, or even use music. So, unleash your creativity, but leave everything that you've learned from real-life roller coasters behind and take a stab at our newest redstone competition on roller coaster rides! I'd use World Edit to terraform some awesome "unexpected scenery" if I was able to use it. I'm still pleased with my coaster even though it incorporates only 1 of those elements. I have a roller coster in the over and it makes you seem to be going from over world, to the nether, then to the end. I love it!